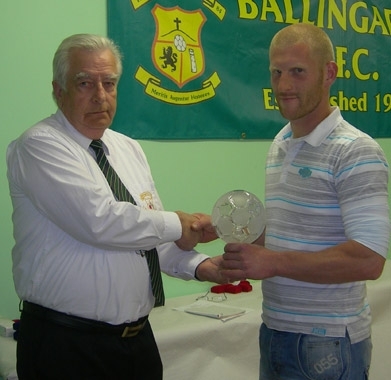 Before signing for Ballingarry at the start of the 2002/03 season, Kelly had proved himself a prolific scorer with neighbours Granagh United. He scored on his first appearance for his new club against Glantine Rovers on August 17th 2002 in what was a Division 1 League Cup group game, a match Ballingarry won 2-1 away. Always the man for the big occasion he wrote himself into the clubs’ history books when he scored the second and insurance goal against Foynes when Ballingarry clinched the Division 1 title in 2002/03 in his first season. However his finest moment in a Ballingarry shirt was without doubt when he scored the only goal of the game against Rathkeale at Clounreask on May 23rd 2004 to clinch Ballingarrys’ first ever Premier Division title. Also during that season he equaled the match haul with four in one game and considering that it was against Newcastlewest in a Premier Division fixture probably makes it a greater achievement than the two previous players who also hit four in a single game. Has scored in every competition that he has played in for Ballingarry with the exception of the Munster Senior Cup while he scored Ballingarrys’ only goal in their Premier Division Cup Final defeat against Rathkeale in 2004/05. His exploits in front of goal for Ballingarry saw him play inter league for the Limerick Desmond League in 2003/04 but unfortunately he wasn’t on the scoresheet during their campaign. His 50 goals have come during 114 games for the club, which averages just under a goal every two games, a strike rate that any centre forward would be proud of. 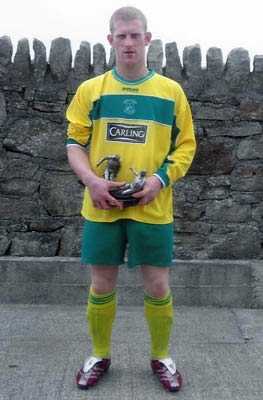 He became just the third player in the clubs history to reach the 100 competitive goal mark when his lone strike against Pallaskenry secured a 1-1 Division 1 league draw on January 30th 2011. By now his strike rate had improved from his first fifty for the club to the point that he reached the elusive century mark in just 190 games for the club. This is surely a remarkable strike rate for a striker who never takes a penalty. Along the way he has notched up 2 hat-tricks while a number of his goals have come at league headquarters at Clounreask. In fact up to this point he has scored for Ballingarry on every occasion that he has graced the hallowed turf in Askeaton. Indeed it was at this very venue that Kelly was to notch yet another priceless goal for the club when he scored the winner just a minute from time in extra time in the Desmond cup final replay against Newcastlewest Rovers to secure the cup for Ballingarry for the second time. He had of course scored in the 1-1 draw on the first day out. Denis also reached the 200 appearance mark for the club during the same season that he got his 100 goal a remarkable achievement.